The clausiliid Agathylla biloba. Photo by V. Wiese, via Palaeos.com. Just a quick post today, as I've not much time. In fact, as I approach D-Day for the thesis, as well as tutoring labs for the next few months, I'm probably going to be putting a bit less up here. I'll try and keep the Taxon of the Week series going, at least. 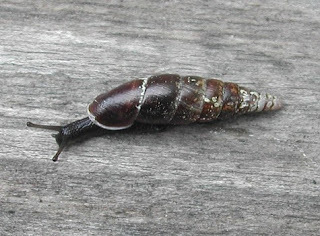 The Clausilioidea are a superfamily of Stylommatophora (land snails). In the system of Bouchet et al. (2005), four families are assigned to this group - Palaeostoidae, Filholiidae, Anadromidae and Clausiliidae. The first three of these are all fossil families, so the Clausiliidae include all living clausilioids. The relationship of the fossil taxa with the Clausiliidae is up for debate - Schileyko (1979) pointed out that the Filholiidae weren't definite clausilioids (while he also thought that Urocoptidae, since excluded from the superfamily, were), while Wade et al. (2006) noted that the "Anadromidae" might be a polyphyletic group, with some related to the Clausilioidea and others to the Acavoidea. Another clausiliid, Cochlodina laminata. Photo by D. Tymanov. Their fossil associates notwithstanding, the Clausiliidae themselves are a clade of undoubted integrity (Wade et al., 2006), containing nearly 1300 living species. Most clausiliids are fairly small snails, though the largest, Megalophaedusa martensi, is a little under five centimetres long. All Clausilioidea are high-spired, with long narrow shells, and the Clausiliidae possess a unique feature called the clausilium, a calcareous plate attached to the opening of the shell that functions like an operculum, closing over the opening when the snail retreats inside (hence their common name of "door snails"). The foot of clausiliids appears surprisingly short (at least to me, but then I'm no expert on snails) compared to the length of the shell. The distribution of clausiliids seems somewhat spotty - main centres are Europe, eastern Asia and South America, with the South American taxa having probably invaded from Laurasia during the Cretaceous (Wade et al., 2006). Mating clausiliid snails. Photo by T. Asami. In the earlier post linked to above, I referred briefly to the division in land snails (which are always hermaphrodites) between "face-to-face" and "shell-mounting" copulation. Face-to-face mating is the more familiar behaviour, where the two mating snails (or slugs) lie alongside each other facing in opposite directions, extrude their genitalia and often both fertilise each other simultaneously. Among shell-mounters, in contrast, one snail climbs on top of the other, both face in the same direction, and generally insemination is unilateral with one individual donating and the other receiving sperm (however, after the iniatial sperm-donator has finished inseminating its partner, they may repeat the process with reversed roles). The two mating behaviours are closely (though not exactly) correlated with different shell shapes - face-to-face copulators are generally low-spired and rounded (like the common garden snail), while shell-mounters are usually high-spired (Davison et al., 2005). 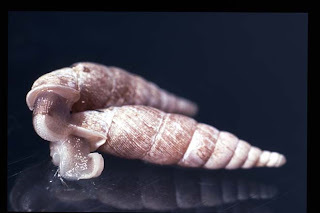 Clausiliidae, to match their high-spired shells, are invariably shell-mounters, though at least one clausiliid genus, Albinaria, differs from the others in that both individuals fertilise each other simultaneously. In another earlier post where I discussed snail chirality (whether their shells were left-handed or right-handed), I mentioned that face-to-face copulators cannot generally mate if they have differing chiralities, because they can't readily bring their genital openings alongside each other. For shell-mounters, on the other hand, inter-chiral matings are far simpler and much more likely to be successful. In light of this, one might expect to see far more cases of reversed chirality among shell-mounters than face-to-face copulators, because the disadvantages of reversed chirality would not be as significant. And according to Asami et al. (1998), this is exactly what does happen - of those snail genera they surveyed including species with reversed chirality, over 90% were high-spired forms and probably shell-mounters. Asami, T., R. H. Cowie & K. Ohbayashi. 1998. Evolution of mirror images by sexually asymmetric mating behavior in hermaphroditic snails. American Naturalist 152; 225-236. Academy of Sciences, USSR 80: 1-69. Yes, the feet of the clausiliids are indeed much shorter than their shells. Then again, that may be the case with most snail species with long shells. BTW, the majority of the clausiliids have sinistral shells. "Face-to-face mating is the more familiar behaviour..." = Best Out of Context Quote Ever.